Banoffee Pies, Cartuli’s Music, Cong Burn, High Hoops, Jive Talk, Livity Sound, London Modular Alliance, Make Me, MogaDisco, Mucho Soul, Party People, Percolate, Raw Silk, Ruf Kutz Video Lounge, Social Joy, Sub Club, Vinyl Pimp, We Are The Wick and Wigflex. Aurora, Banoffee Pies, BFTT (live), Brassica (live), Bruce, Ceri, Chaka Khan’t, Chaos In The CBD, Dark Sky, Desert Sound Colony, Donna Leake, EM:LY, Em Williams, Glowing Palms, Guilhem Monin, Harri & Domenic, High Hoops, Hot Blood, Howes, Imogen, iona (UK), Jane Fitz, Jasper James, Jaye Ward, Jess Farley, Jon K, Kay Suzuki, Keith Tenniswood (Dub Set), Kickin Pigeon, Kincaid, Kit Seymour, Kode9, Kowton, Krywald & Farrer, Lack, Làrus, Livity Sound, London Modular Alliance (live), Lone, Love Glove, Lucid Stannard, Lukas Wigflex, Martin Josef, Michelle Manetti, MogaDisco, Mucho Soul (DJ A.K.A & Ket Shah), Nic Baird, Nick The Record, O’Flynn, Partner Music, Pelski, Perfume Advert (live), Peverelist, Radioactive Man (live), Randall (Acid House Set & Blue Note Set), Randy Brunson, Raw Silk, Reckonwrong, Robin, Rubin, Ruf Dug, Rupes, Salary Boy, Saoirse, Steevio & Suzybee (Live A/V), Stefano Ritteri, Sunship, Swayward, Tayls, Tom Jay, Unai Trotti + more to be announced. 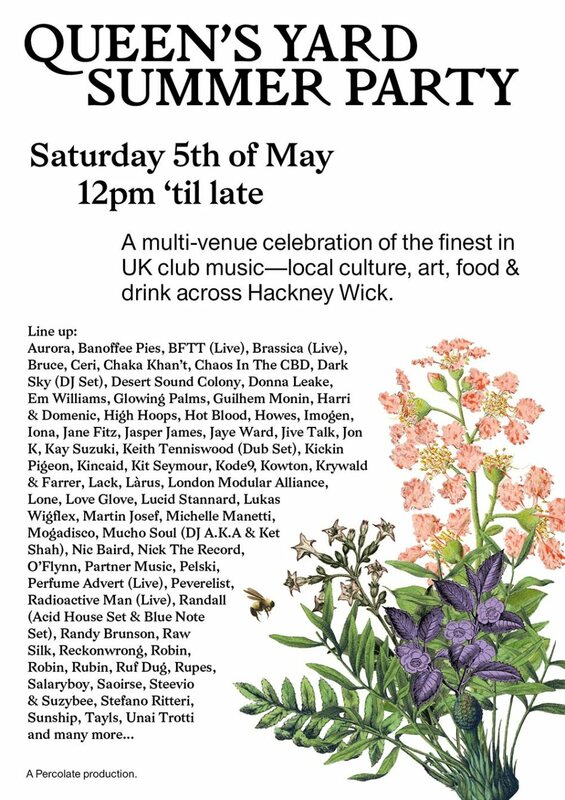 Banoffee Pies, Cartuli’s Music, Cong Burn, High Hoops, Jive Talk, Livity Sound, London Modular Alliance, Make Me, MogaDisco, Mucho Soul, Party People, Percolate, Raw Silk, Ruf Kutz Video Lounge, Social Joy, Sub Club, Vinyl Pimp, We Are The Wick, Wigflex + more to be announced. White Post Café + more to be announced. After a special 2017 edition, we return on Saturday the 5th of May for another Wick-wide bonanza – this year taking in even more fantastic musical partners, DJs, exhibitors, venues, traders and stalls. Not just about the music though – keep em peeled for a one-off programme of arts, food traders, market stalls and craft beverages galore. – Once a venue is full, there will be a one-in-one out policy – please make sure you arrive in plenty of time to see a particular artist! – Due to licensing restrictions, alcohol cannot be taken out / between venues. – Those that are students or low-waged, email us at info@percolate-migration.flywheelsites.com – We will have a limited number of advance tickets for those that qualify.